Bash: ... by far the most delegates - Donald Trump, from getting even more?" This image was captured during 3:51. 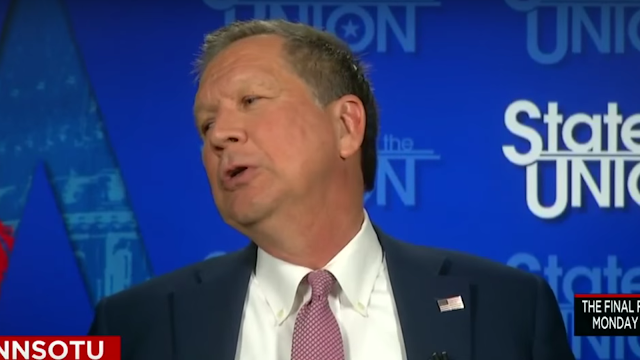 From 3:48 through 3:52, Kasich extends his torso backward to his left, moves laterally (back and forth), as he says, "Look" - and then resumes his more straightened, relatively still posture. This (backward) torso extension (with or without the additional side-to-side movement) is a nonverbal signal highly indicative of frustration. At 3:53, before Governor Kasich answers Ms. Bash, we see him display the cluster of: thinned, horizontally configured lips (particularly his upper lip), a clenched jaw, a dimpled chin, protruding lower lip, flared nostrils, lower eyelid tension, tension in mustache area, cheek dimpling - a nonverbal combination which indicates an amalgam of anger, disgust, frustration and impatience. 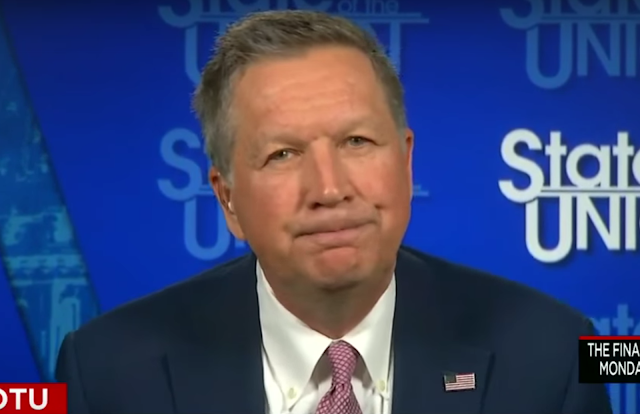 In summary, John Kasich has a high sincerity quotient (and thus also is believable and likable). Specifically, he has every intention of attending the GOP Convention in July in Cleveland as a candidate. He also believes his chances are relatively good at emerging as the Republican Nominee for President. The Governor however, during this interview, is also displaying relatively high levels of anger, frustration, disgust and impatience.